New data from state geologists show that an earthquake fault runs below Rodeo Drive and Beverly Hills’ shopping district, heightening the known seismic risk in an area famous for Cartier, Gucci, Prada and other luxury brands.The California Geological Survey’s final map has the Santa Monica fault zone cutting through the so-called Golden Triangle, running between Santa Monica and Wilshire boulevards. 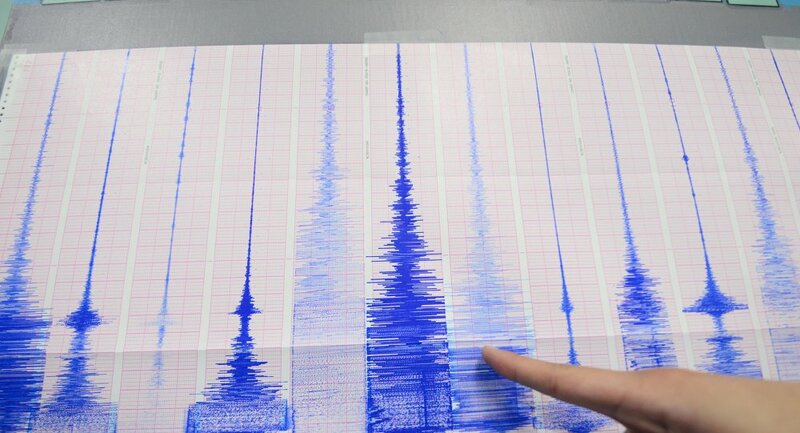 The Santa Monica is one of several faults running through highly populated areas of Southern California to generate interest and concern from seismic experts and government officials. The fault zone cuts through the heart of the Westside, straddling or paralleling Santa Monica Boulevard through Century City and Westwood before veering due west, with segments running into Brentwood, Santa Monica and Pacific Palisades. It’s capable of producing a magnitude 7 earthquake. Experts believe the most recent major earthquake on the Santa Monica fault occurred 1,000 to 3,000 years ago. During the 1971 Sylmar and 2014 Napa earthquakes, homes built atop a fault suffered major damage as their foundations were torn apart, while homes just a few hundred feet away suffered far less damage. Heavy snowfalls in Iran that began on Thursday and continued through Saturday night have brought joy to ski-lovers and a lot less fun to drivers and municipal workers. Some 20 northern and western Iranian provinces have been hit with their first heavy snowfall after a month of abnormally warm winter, IRNA news agency reported Sunday. Both of Tehran's international airports Imam Khomeini International and Mehrabad were shut down due to poor visibility and "until further notice." 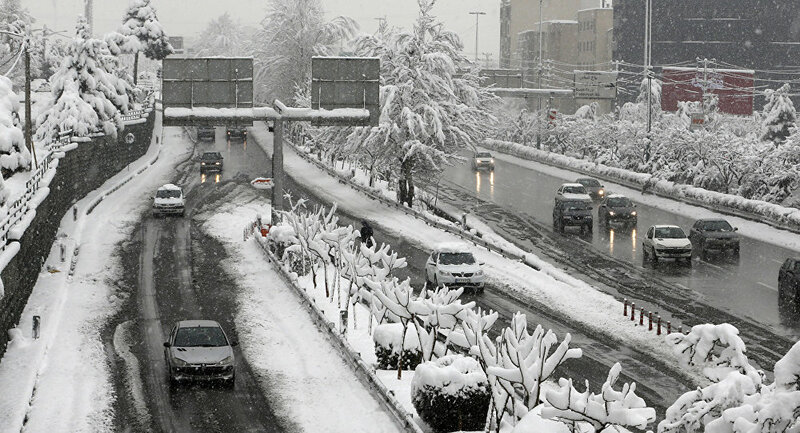 Heavy snowfall has also caused a lot of trouble for drivers, who became stuck on highways outside of the Iranian capital. 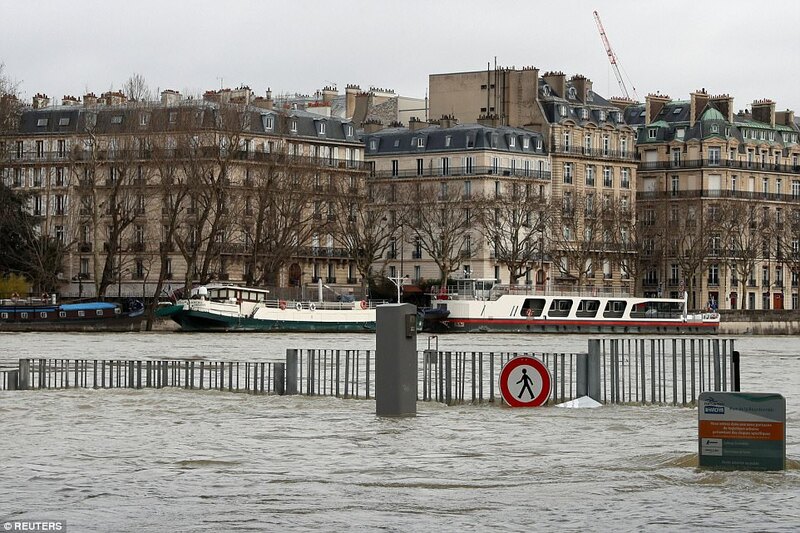 The authorities have mobilized hundreds of Red Crescent teams to aid the drivers, while some 6,600 people have been put up in emergency accommodations. The deepness of snowdrifts in mountainous areas has reached some 1.3 meters, while the overall temperature is set to drop below —20 Celsius. According to the state gas company, it expects a rise in gas demand for certain northern provinces. 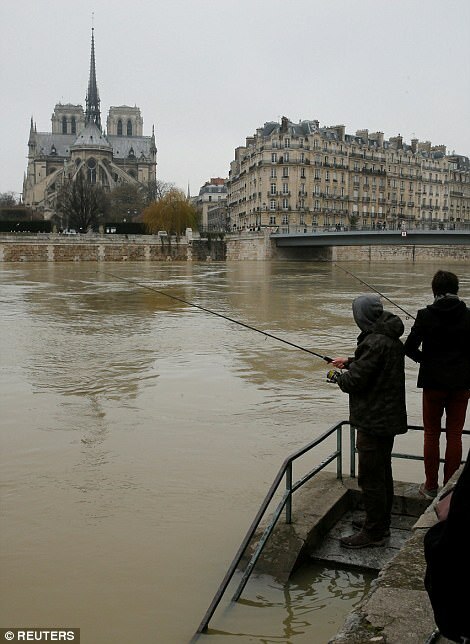 River Seine has swollen to more than 13ft higher than its normal level amid the third-wettest winter since 1900. 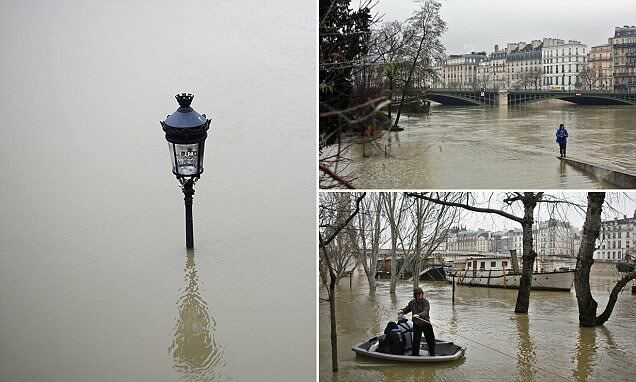 The Louvre is on high alert, with its lower level closed, and Musee d'Orsay and Orangerie galleries also at risk. 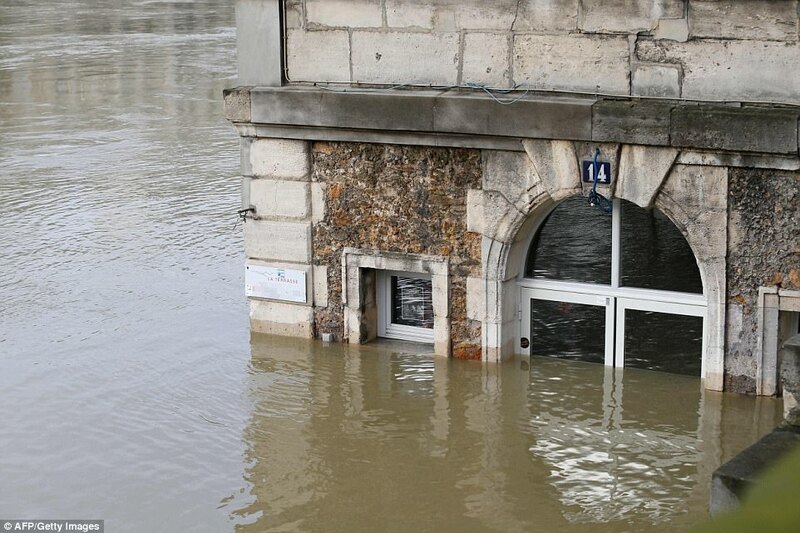 Vigicrues flooding agency believe the river will continue to rise, peaking at 13.1ft this evening or on Monday. Very interesting and worth listening to several times given how much information he shares. Olympic Park, northwest Washington 70 miles west of Seattle, knocking down overnight. Micro bust localized downdraft of air could be cause would take winds 70=80mph. There were no thunder storms in the area so nothing shows cause. Frigid iguanas in Florida. Snowball fights on North Carolina’s beaches. 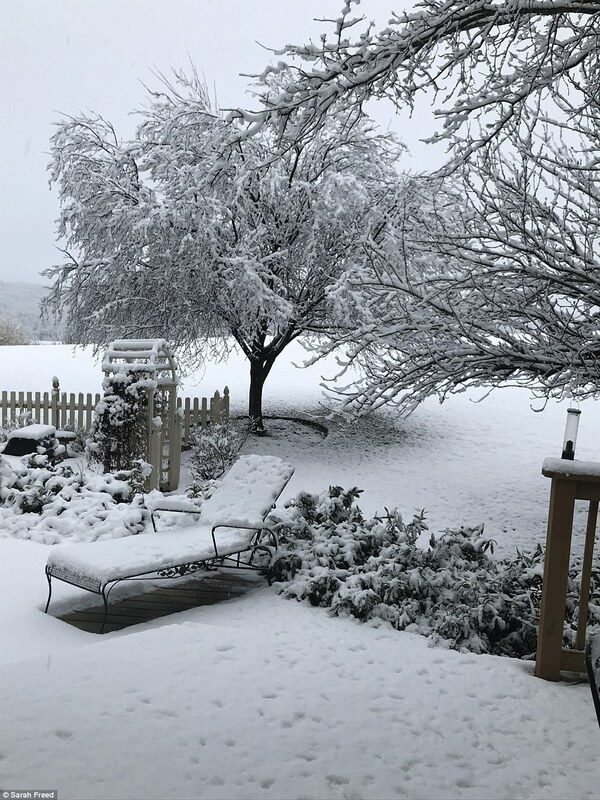 Recent winters have delivered a bitter chill to the Southeast, reinforcing attitudes among some that global warming is a fraud. 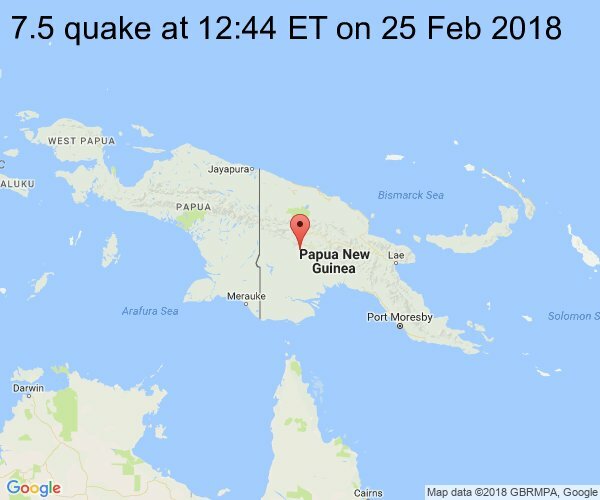 and Scientist Predict Pole Flip? 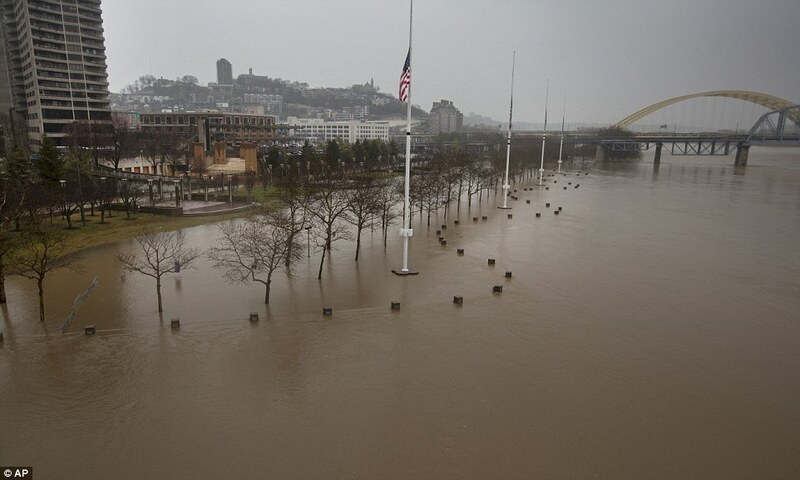 Flood watches were posted on Saturday morning from northern Texas to western Pennsylvania including many big cities like Dallas, Little Rock, Nashville, Louisville and Pittsburgh. Behind the storm system comes cooler air and wintry weather resulting in a number of winter storm warnings and advisories being posted. 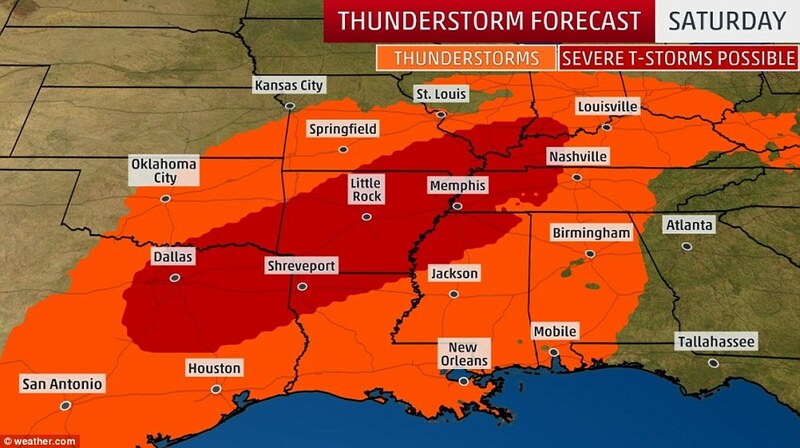 There will be heavy rain and dangerous thunderstorms in the Mississippi River Valley from Little Rock to Memphis, as well as along parts of the Midwest from Paducah, Kentucky to Cincinnati. 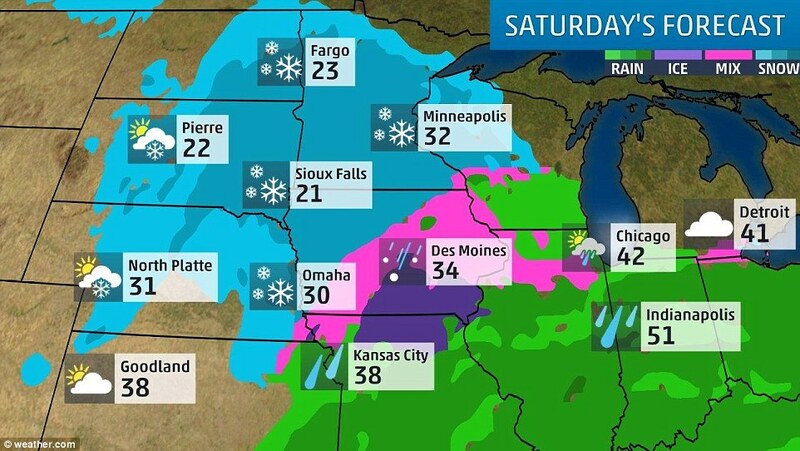 At the northern edge of the storm, snow will develop and intensify as it heads towards Minnesota. There will be low visibility and the snow will be likely be an issue throughout Saturday evening. 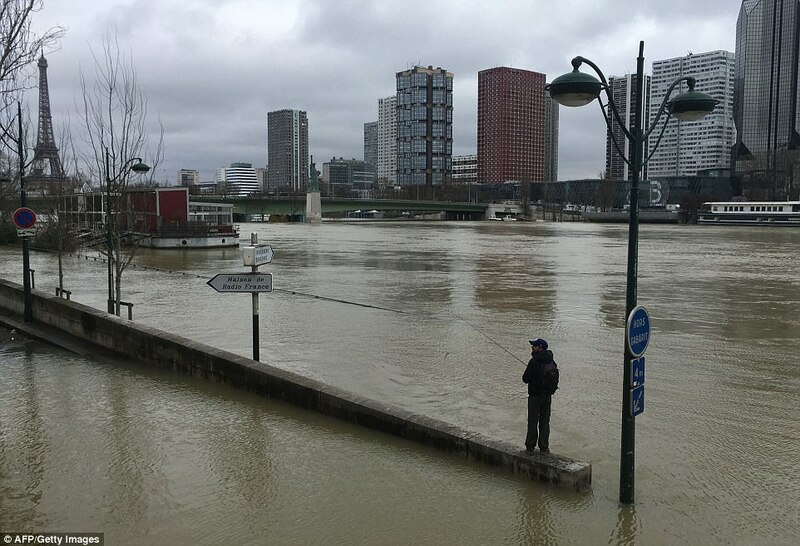 The flooding has already claimed at least three lives this week. A one-year-old girl was found dead in her family's flooded Michigan yard after reportedly wandering from the home on Wednesday, according to the AP. Another death was reported Wednesday when 53-year-old Victor French's vehicle was swept off the road as he attempted to drive across a flooded bridge near Stilwell, Oklahoma, the Oklahoma Highway Patrol announced. 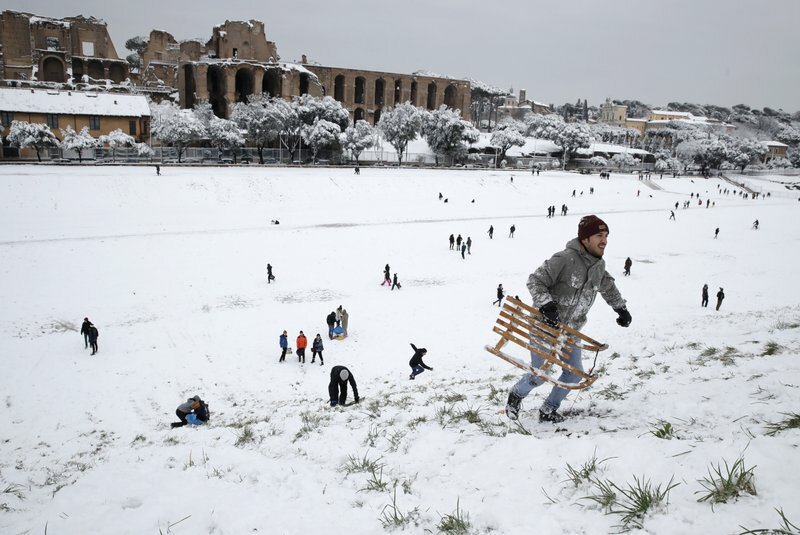 ROME (AP) — The Arctic storm dubbed the “Beast from the East” set record temperatures across much of Europe on Monday and brought a rare snowstorm to Rome, paralyzing the city and giving its residents an unusual chance to ski, sled and build snowmen in its famous parks and piazzas. Elsewhere, the storm set dangerously low temperatures: Meteorologists in Germany reported a record low for this winter of -27 C (-16.6 F) on the Zugspitze mountain in the Alps. Moscow, as well, recorded its coldest night this winter, with the mercury dipping to nearly -20 C (-4 F) on Sunday night. 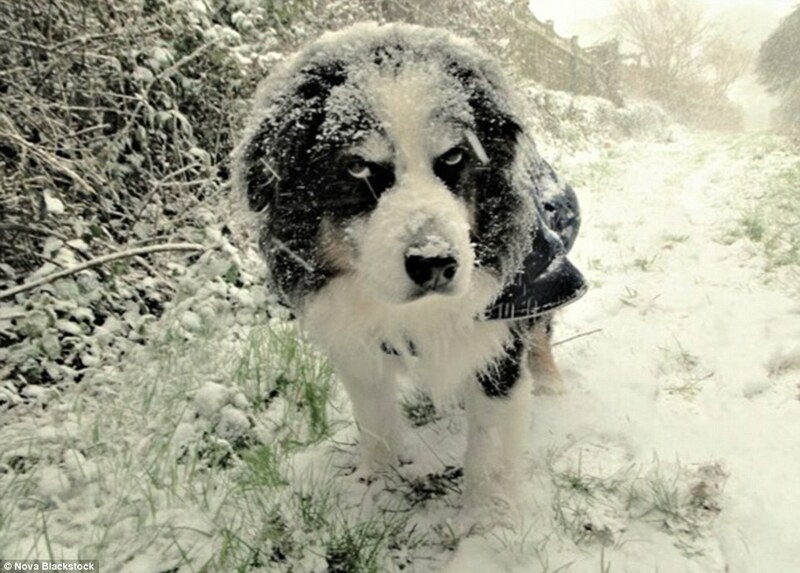 The intense winter weather has been dubbed “The Beast from the East” by British tabloids, citing Siberia as the source of the frigid temperatures. In Croatia, about 1,000 soldiers joined in the clearing operations in the worst-affected areas, where over 1.5 meters (some 5 feet) were reported. 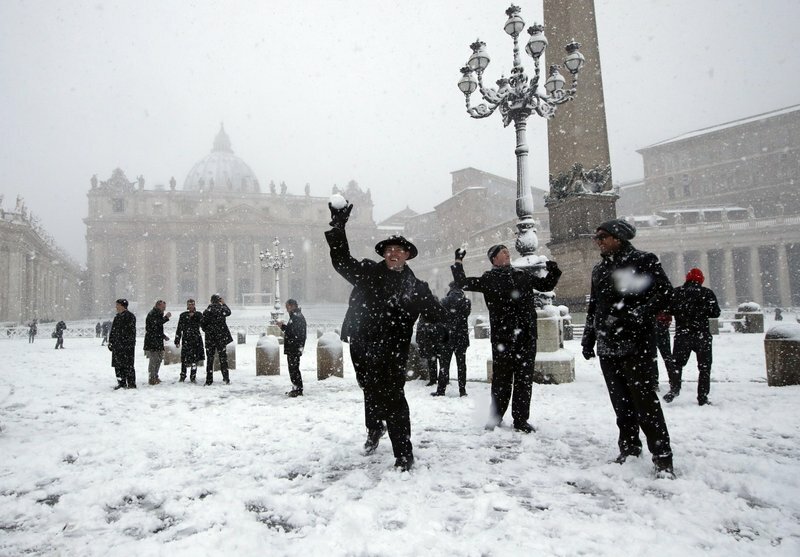 Rome saw just a few centimeters (inches) but it was enough to close schools. Parks that usually stay green through winter were blanketed with snow, giving eager Romans a rare opportunity to go sledding, snow-shoeing or skiing. Even the Circo Massimo became a hotspot for snowball fights, while Piazza Navona, with its famed Bernini fountains, turned into a snow-dusted winter wonderland. Rome’s Mediterranean climate and proximity to the sea usually result in mild winters, such that restaurants often keep outdoor seating open, albeit with space heaters, even through the coldest months of the year. Chrome and copper miners in northern Albania have not been able to go to work after heavy snow blocked mines. 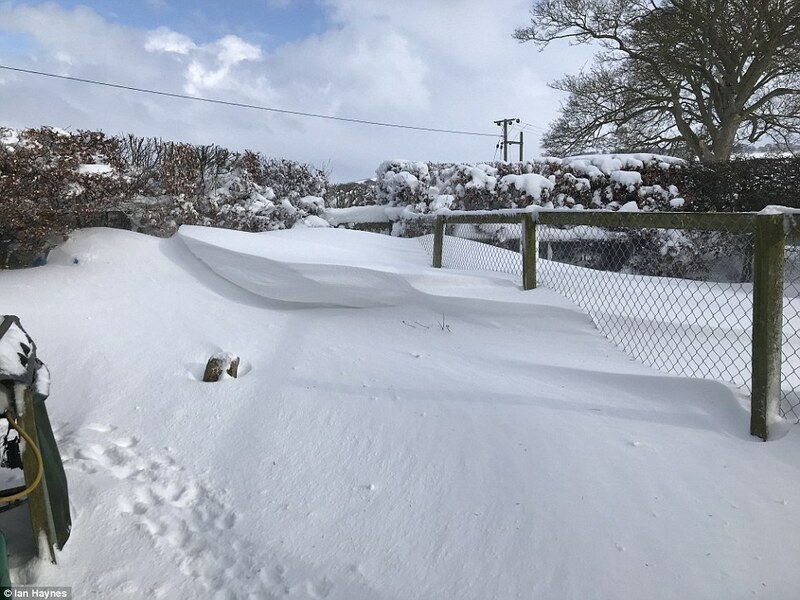 Some areas are languishing under 2.5 meters (8.2 feet) of snow and that’s made some national roads impassable, too. Strong winds have also damaged power plants, causing blackouts mainly in rural areas, while many schools in the countryside were closed or held with reduced classes. In neighboring Kosovo, the heavy snow has also caused serious traffic problems including an increase in car accidents. Officials in Lithuania say this winter’s record low temperatures have claimed the lives of at least three people over the weekend in the Baltic nation’s capital. 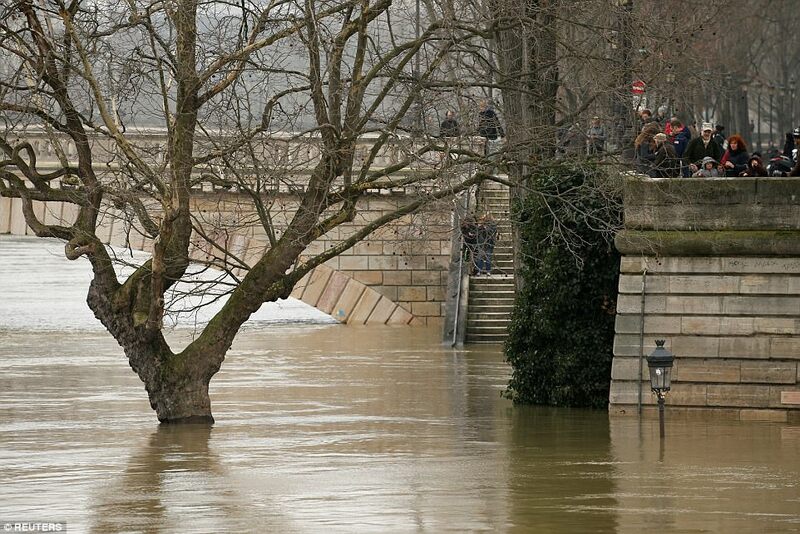 Emergency medical officials in Vilnius reported Monday that, in addition, some seven people were have received substantial frostbite to their hands and feet in the past few days. 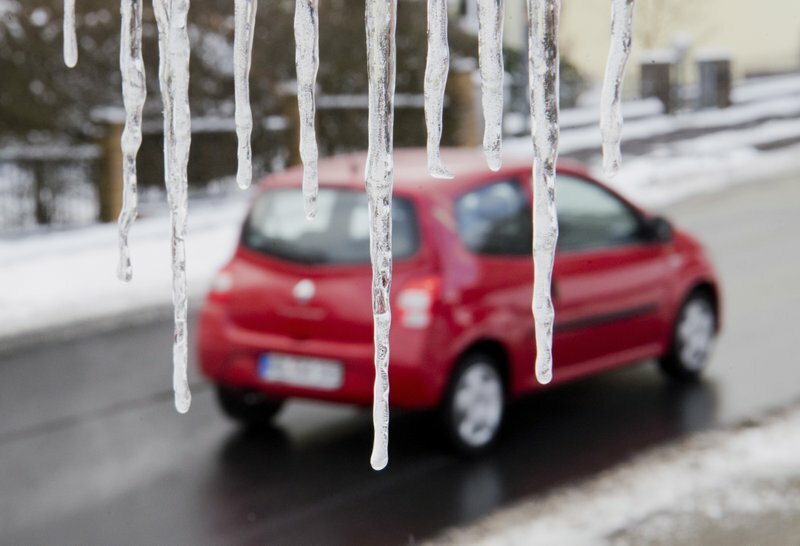 The Hydrometeorological Service said temperatures plunged as low as minus 24 degrees Celsius (minus 11 Fahrenheit) in the central Lithuanian town of Ukmerge both Sunday and Monday. Baltic neighbor Latvia reported that eight people have been rushed to hospital with hypothermia and frostbite due to the cold spell. Estonia’s state weather service is forecasting the cold spell to remain in the Baltic region throughout this week, with temperatures expected to drop to minus 29 degrees Celsius in some areas. Croatia’s state TV says the collision of a truck and a bus in a snow-covered northwestern region has seriously injured 14 people. The report says the accident happened around 11 a.m. Monday in the mountainous Gorski Kotar area that has been worst-affected by a spell of harsh winter weather in the country. Croatian television says the two drivers are in critical condition following the collision. Croatian media say the injured have been transferred to the nearest hospitals. Freezing temperatures and heavy snow have closed down schools and restricted traffic throughout Croatia. Temperatures have dropped to freezing even along the Adriatic coast. 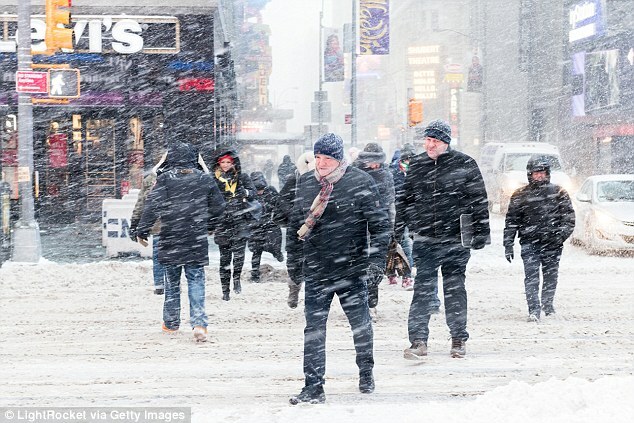 Forecasters warned more than 20cm of snow from the 'Beast from the East' is expected to fall across the UK until midday, BRITS are facing potential commuter chaos this morning after the "Beast from the East" forced rail companies to cancel 200 trains and airlines to postpone flights. 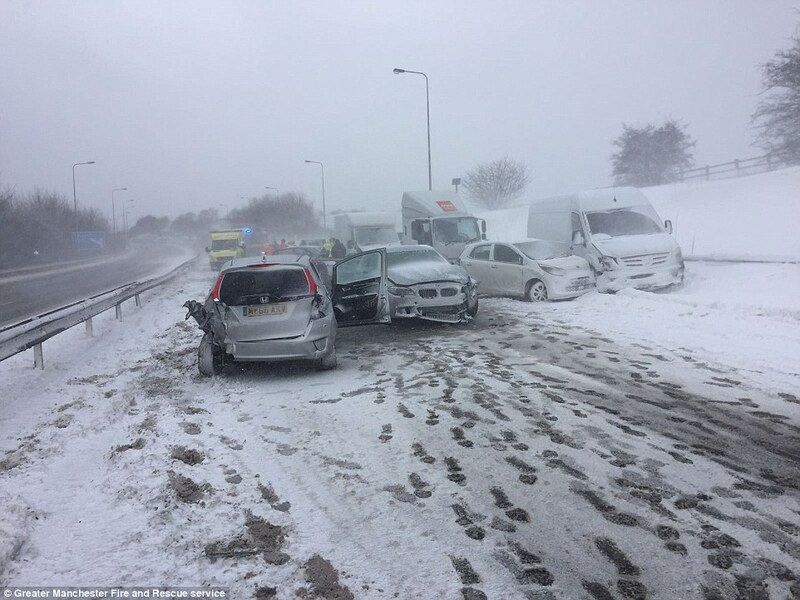 Forecasters also warned how roads across the UK could be too dangerous to drive on, with more than 20cm of snow expected to fall across the country up until midday. Amber warnings have been issued for snow showers this morning, covering the South East and North East of England and the East Midlands. 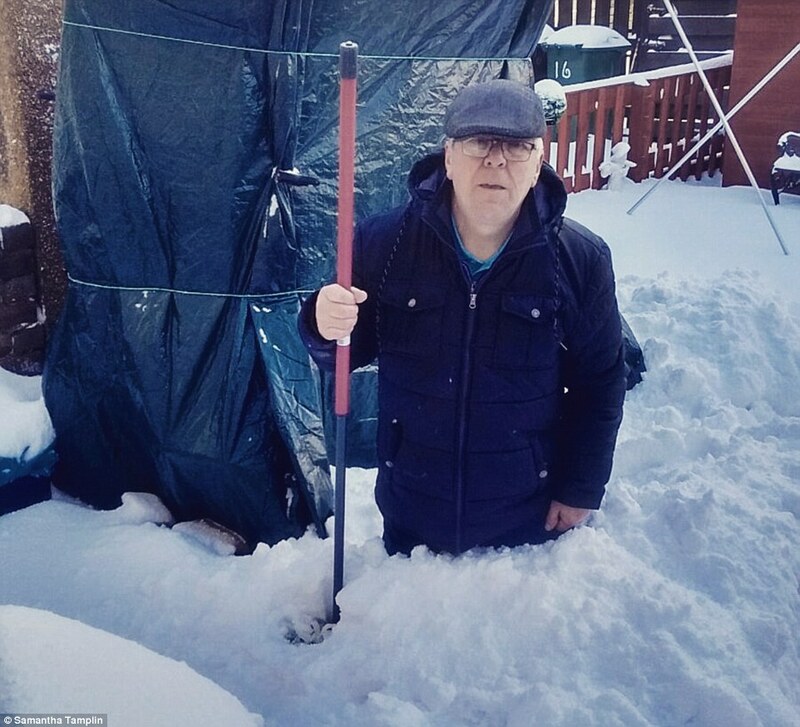 Up to eight inches of snow has blanketed much of the country with Brits shivering in -15C temperatures as the "wind chill factor" makes it feel colder than it has in 27 years. 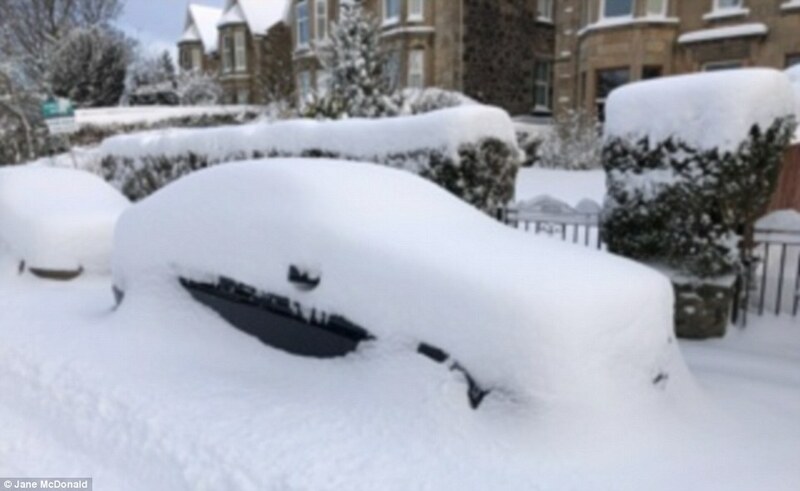 The Met Office revealed how the snow storm could lead to people becoming stranded in their cars along with further rail and air cancellations. This morning, pictures emerged of traffic struggling through a blanket of snow on the A19 in Teeside. Forecaster Marco Petagna said there would be some "quite treacherous driving conditions" due to the snow, as many make their way into work. Scientists at the Russian Academy of Sciences have warned that a huge magnetic storm will strike Earth on March 18, disrupting satellites, GPS navigation and power grids across the planet. According to doctors, people may experience headaches and dizziness as a result of the storms. 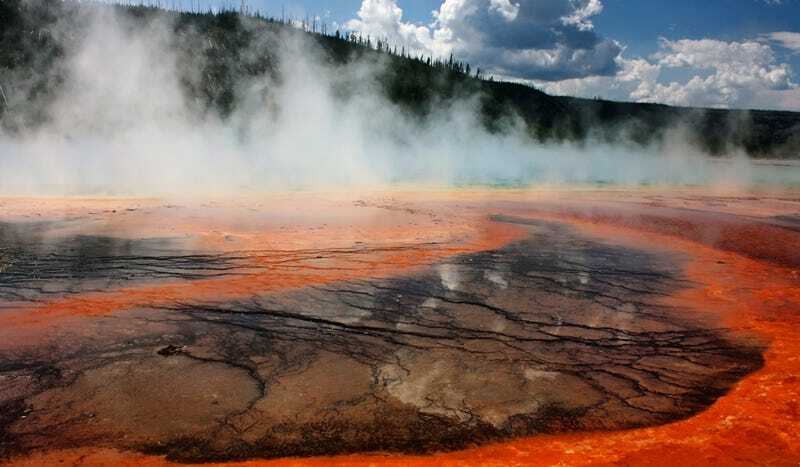 During a magnetic storm, doctors advise to drink more fluids and to avoid using electrical equipment. “Try to sleep. Do not overload the body with excess coffee, alcohol, heavy food,” recommends therapist Victoria Poroshenko. Rt.com reports: According to this graph, three days before the storm, on March 14, 16 and 17 , geomagnetic alterations will be experienced. Before that period, the magnetosphere will be calm. The magnetic storm that will reach Earth on March 18 will be the third since the beginning of this year. The first was recorded on January 15 and the second on February 19. 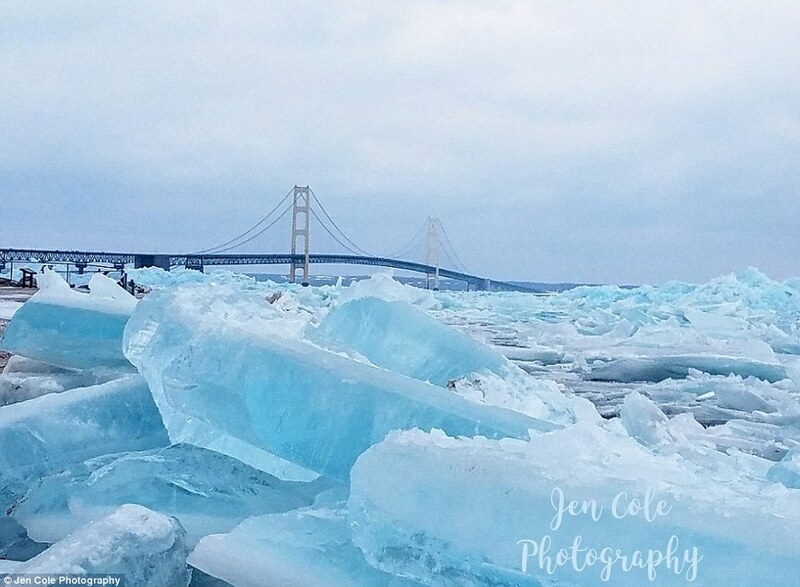 The epic, natural phenomenon was seen forming on Michigan's upper and lower peninsulas over the weekend. Blue ice is formed when snow falls on a glacier, is compressed, and becomes part of the glacier. Air bubbles are squeezed out and ice crystals enlarge, preventing light passing through, making the ice appear blue. Dozens of people lined up along the shore to take photos and climb onto the big blocks of ice, some towering over 30 feet tall. A combination of wind and the current pushed the chunks to shore, where they piled up on top of each other to build 'mountains' of ice. 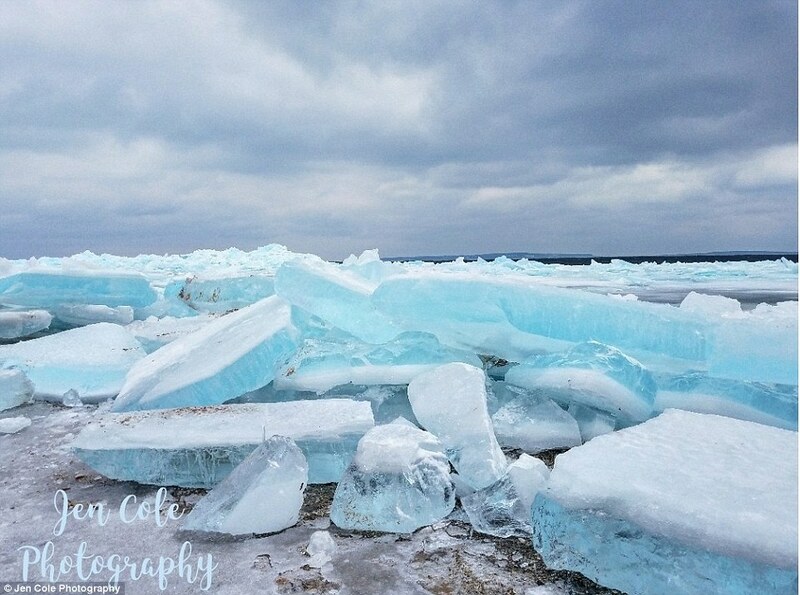 One photographer said it had been seven years since she saw blue ice chunks along the Straits of Mackinac. 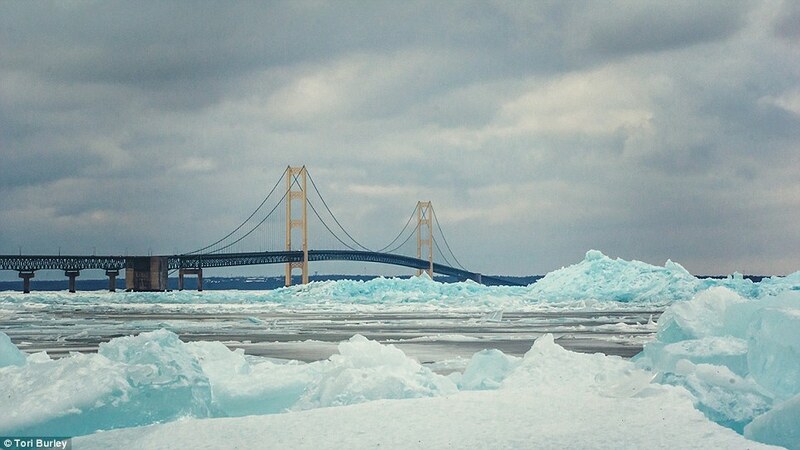 This is the waterway that flows under the Mackinac Bridge, connecting two Great Lakes - Lake Michigan and Lake Huron. 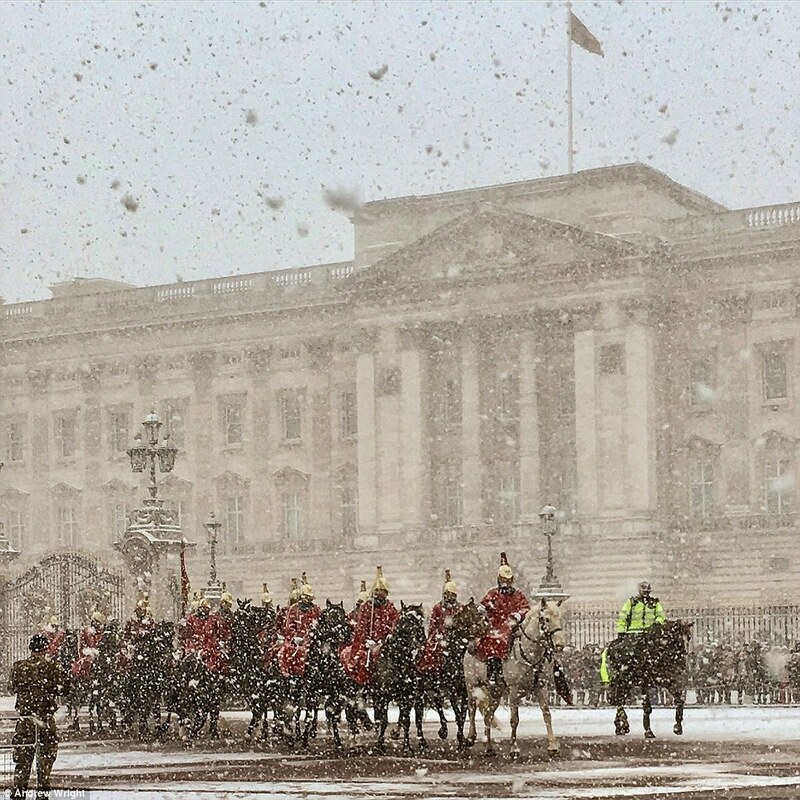 - Conditions could worsen in Britain with 60mph gusts from Storm Emma bringing 'blizzard-like' weather. 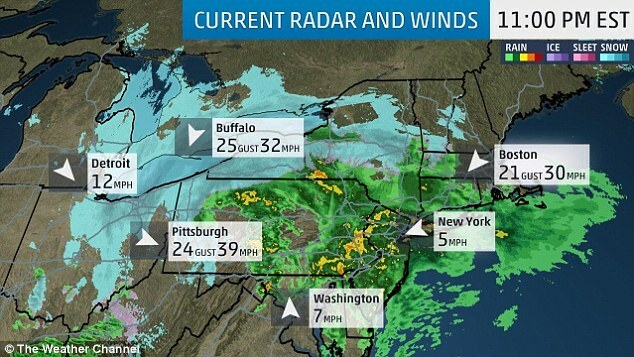 The Northeast is bracing for a 'bombogenesis' that experts say will bring violent 80mph wind, torrential downpour, snow and heavy flooding, resembling the harshness of January's 'bomb cyclone'. 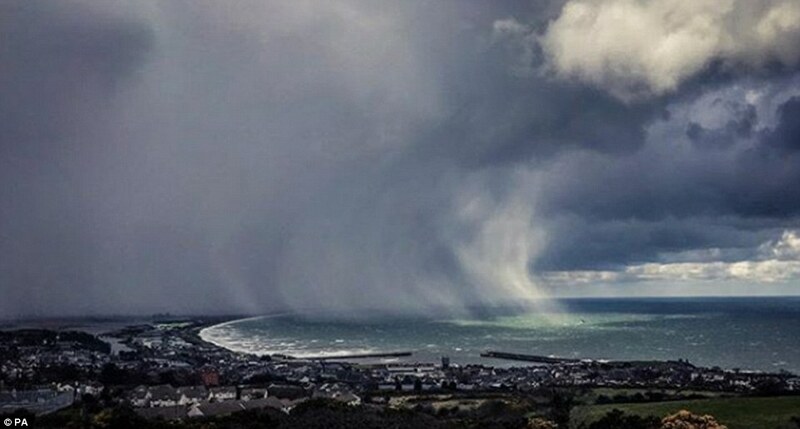 Weather experts said Thursday that Winter Storm Riley will undergo 'bombogenesis', caused by a rapid drop in atmospheric pressure of at least 24 millibars in a period of 24 hours or less. 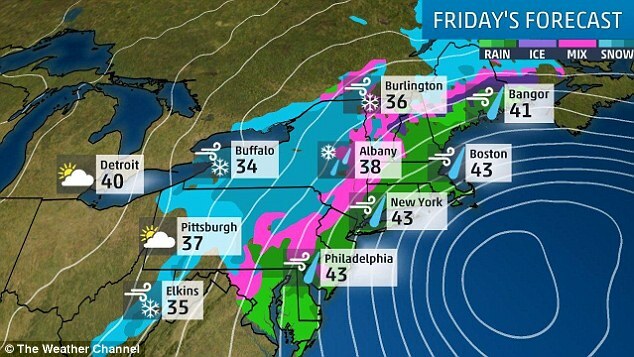 The drop in atmospheric pressure will force the storm to form into an intense nor'easter into Friday. A sudden pressure plummet on Friday is expected to hit the Atlantic coast leading into Saturday. 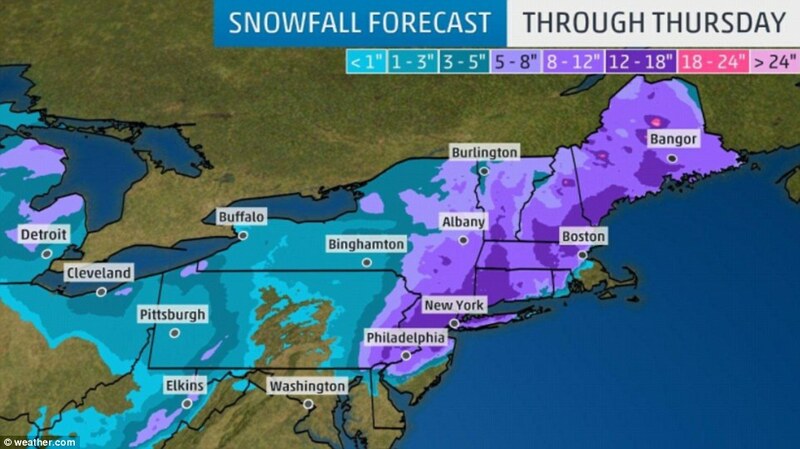 From Boston down through Rhode Island, two to five inches of snow is expected. 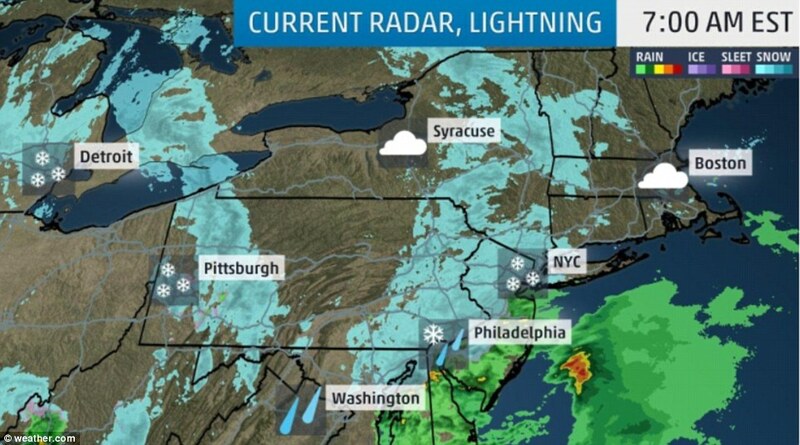 On Thursday night, snow started to spread across the eastern Great Lakes and into upstate New York and northern Pennsylvania. A massive snowstorm Friday in Northern California could bring the state’s lengthy drought to end while leaving two feet of snow in the mountains near Los Angeles. The Sierra Nevada Mountains has seen two feet of snow and winds gusting over 100 miles per hour. Forecasters are expecting seven feet of snow in some areas of the mountain range. Meanwhile, more than 22,000 Montecito residents evacuated their homes as rain continued to pound the area — California’s weather comes as a nor’easter clobbers parts of the East Coast. “The worst of the storm has passed, and we are cautiously optimistic that due to a significant amount of pre-storm preparation we have come through this with minimal impact,” Rob Lewin, director of the Santa Barbara County Office of Emergency Management, said in a statement. Things have not been that much better on the East Coast. A so-called bomb-cyclone condition is shaping up on the other side of the country that could be even more intense than one from earlier this year. Predictions are it could cause record flooding and intense damage and be the most intense nor’easter in 20 years, according to the National Weather Service. Experts are predicting moderate to major flooding for three tide cycles in Boston. A 3-foot storm surge is coming into the city on top of approximately 11-foot tides, flooding could set records in the city and be worse than the Jan. 4 storm. 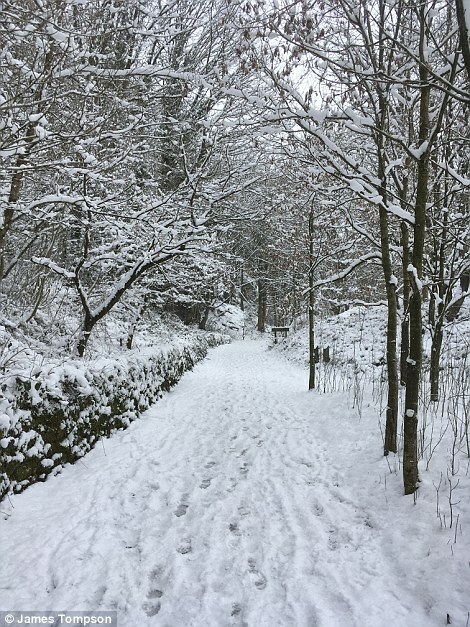 January’s snowfall covered approximately 49 percent of the northern section of the country leading up to Christmas Day of 2017. 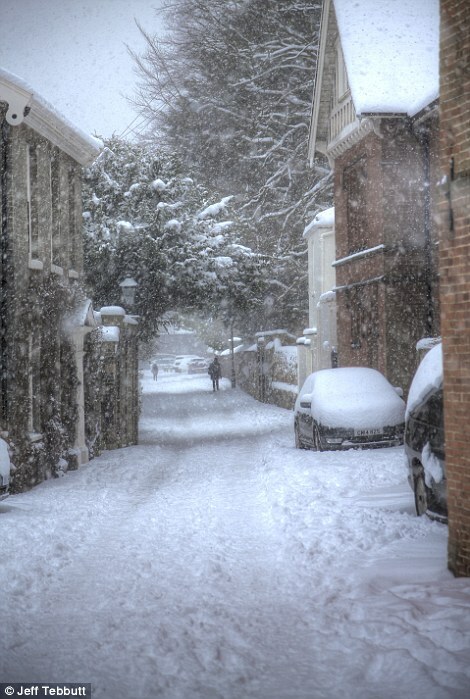 It made a “White Christmas” for almost half of the country, not including Alaska and Hawaii. Pennsylvania county was clobbered with 60 inches of snow in two days following Christmas. The storm shattered records and required the national guard to help keep the roads clear and residents safe. Lighthouse Rd. begins to flood during a large coastal storm March 2, 2018 in Scituate, Mass. A tractor-trailer overturned on the Verrazano-Narrows Bridge in New York, photos showed. 'The big problem is that the storm this week is coming so soon after the destructive storm from last Friday,' AccuWeather Senior Meteorologist Alex Sosnowski said. 'It will disrupt cleanup and restoration operations and is likely to cause a new but less extreme round of travel delays, power outages and damage from falling trees.' A slight consolation is that the storm is not expected to bring the coastal flooding like the one last week. Some coastal New England and New Jersey communities are still feeling the effects of that storm. The National Weather Service issued a winter storm warning that stretched from eastern Pennsylvania to most of New England, which was due to be in effect through Thursday morning. 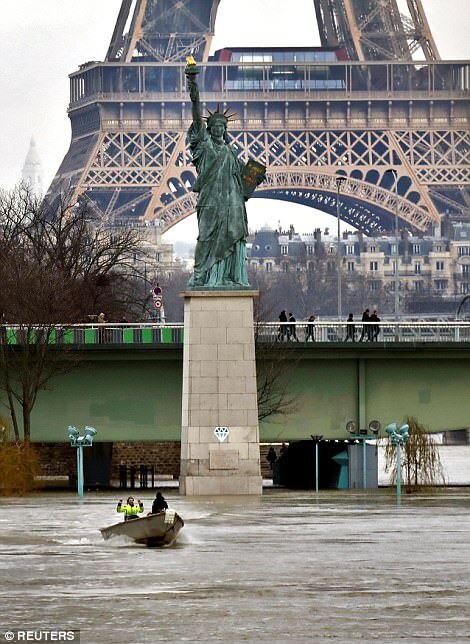 An estimated 60million people are in the path of the storm. This is more than just his daily post. It's worth the watch.